The purpose of the Marquette County Horse Club is to provide horse people with Horse related activities and to support the Marquette County Fair. ﻿Meetings are held the last Tuesday of every other month and are open to members and nonmembers alike. Founded on November 8, 1990. 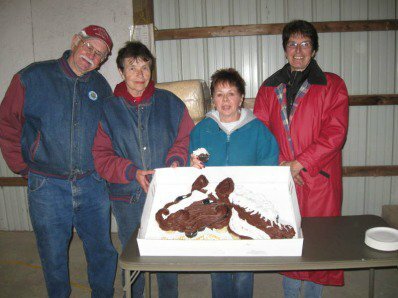 Pictured members displaying the 20th anniversary cake are: Ray Meyer, Joyce Meyer, Maddi Zimmerman, and Jackie Hurley 20 Year Members! We have yearly work bees at the Marquette County fairgrounds to prepare the barns and arena for upcoming horse shows and the fair. We have helped support the Marquette County Fair every year! Each Christmas, we pick an organization to donate to. Previous Christmas donations include: Pigs N Heat fire relief fund, St. Vincent DePaul, The Salvation Army's Adopt a Family, Pipers Rescue Ranch, and Marquette Youth Wrestling just to name a few. This year (2016), we allocated funds for The Salvation Army's Adopt a Family program. 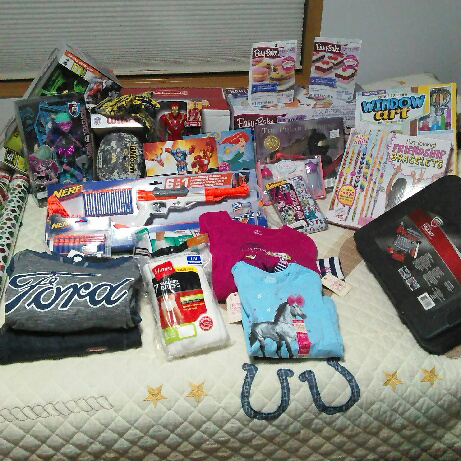 A lucky family received a pile of gifts from the Club.